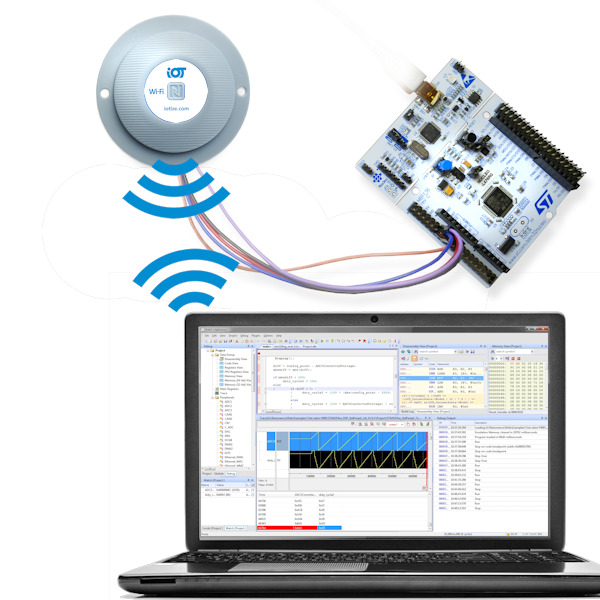 TapNLink Primer evaluation kit for implementing BLE and NFC connectivity for smartphone connection to MCU-based electronic systems enabling local monitoring and data logging on a dedicated IoT Cloud platform. The TapNLink Primer enables the connection of your STM32-based electronic system to a smartphone via the Bluetooth Low Energy (BLE) interface (range: 10 m) and/or Near Field Communication (NFC) interface (range: 3 cm). Using the smartphone as a gateway, the Primer transfers application variables to a dedicated, provisioned, pre-configured IoT Cloud environment where you can view the evolution of variables, record and analyze this data and export it. With TapNLink Primer, it takes just minutes to create your first IoT proof-of-concept. The Primer connects to your host application via 2 of the microcontroller's GPIO using either the SWD (debug) protocol or the proprietary S3P protocol. In just minutes, configure the Primer with variables to be monitored and their access parameters (passwords, read and/or write access, data logging, etc.). Based on this configuration, our IoTize Studio software configures the Primer and provides a sample smartphone app that serves as a local user interface for viewing and/or modifying variables and as a gateway for data transfers to the Cloud. The TapNLink Primer (dimensions: 35mm x 25 mm x 6 mm) can be easily integrated into your hardware design. It can also be deported to a distance of up to one meter from the target microcontroller. TapNLink Primer supports local security measures at the module level including definition of user profiles (login/password, access rights to specific variables) and encryption of communication channels. Smartphone applications are based on the IoTize Communication Service app for Android (v4.0.3 or later versions) and iOS (v10) smartphones. This app manages the local wireless interfaces (NFC, BLE, Wi-Fi) on the smartphone. Applications can be developed as native apps or HTML5/CSS hybrid apps. The TapNLink Primer also includes a sample microcontroller application firmware for STM32 microcontrollers and an accompanying Sensor Demo app for Android and iOS smartphones to help you get started. Includes RKit-ARM Lite, RKit-STM8 Basic code size limited software licenses. Package of 20 TapNLink BLE and NFC (Type5) module for local smartphone connection with microcontroller-based electronic systems. Package of 20 TapNLink NFC-only (Type5) module for local connection of mobile devices to microcontroller-based electronic systems. Package of 100 TapNLink BLE and NFC (Type5) module for local smartphone connection with microcontroller-based electronic systems. Package of 1000 TapNLink BLE and NFC (Type5) module for local smartphone connection with microcontroller-based electronic systems. TapNPass Nomad BLE and NFC (Type5) wireless adapter for local connection of mobile devices to electronic systems via RS-232, RS-485 or USB fieldbus. Supports Modbus in protocol managed mode. TapNLink Primer evaluation kit for implementing TnL-FIR103 BLE and NFC modules for connection of MCU-based electronic systems to mobile devices. Note : Android, iOS compatible. Note : Software only. Node locked license by software serial key. Extends user support contract for continued access to software updates and direct support for one additional year. Offer applies only to purchase RKit STM8 Lite licenses.